Do you or someone you love suffer from snoring or sleep apnea? People suffering from Obstructive Sleep Apnea are literally suffocating in their sleep. The sleeper's airway is blocked by structures like large tonsils, a receding jaw, or an oversized tongue. When the body does not get adequate oxygen during sleep, the sleeper can snore loudly and gasp for air. This can occur hundreds of times every day. 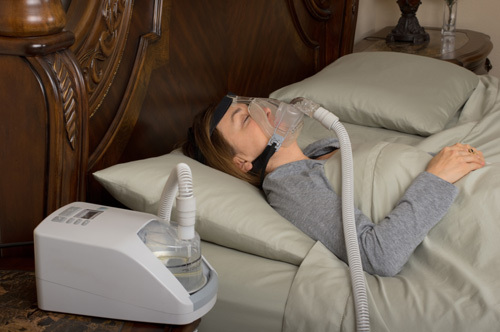 An estimated 50,000 deaths occur each year due to sleep apnea. These deaths are premature and highly preventable if patients receive the proper treatment. Obstructive Sleep Apnea is diagnosed by a sleep physician using a polysomnogram or "sleep study." During a sleep study, a sleep physician monitors sleep functioning while a patient rests overnight. The sleep physicial evaluates the data collected during the sleep study to diagnose sleep disorders and related medical problems and to recommend treatment. Cedar Rapids dentist Dr. Kristyn Watson works with sleep physicians to treat obstructive sleep apnea with oral appliance therapy. How can dentists treat obstructive sleep apnea? Snoring and obstructive sleep apnea can be treated with surgery, a CPAP machine or oral appliance therapy. Oral appliance therapy is the least invasive treatment option. It involves the selection, fitting and use of an appliance to hold the jaw forward to maintain an open airway during sleep. Dentists like Cedar Rapids dentist Dr. Kristyn Watson with specialized training in oral appliance therapy are uniquely qualified to treat obstructive sleep apnea with customized appliances. Because oral appliances can affect the teeth and jaw, a dentist's expertise in these areas is also required for successful treatment. Dr. Kristyn Watson will evaluation each patient's specific symptoms to select the most appropriate oral appliance to correct the airway obstruction and breathing conditions to make breathing easier. Call 319-540-8326 now to schedule a consultation with Dr. Kristyn Watson or request an appointment online.